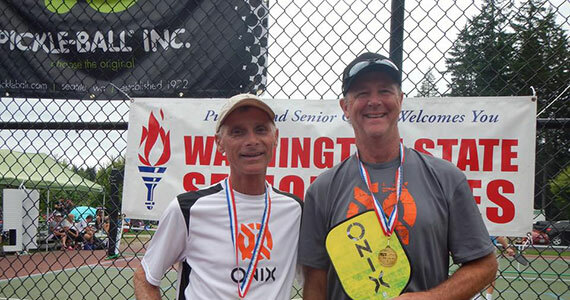 At Onix, we are pickleball fanatics, just like you. We love the game and are committed to growing the sport of pickleball with top-of-the line products - a job that we take very seriously. Founded in 2005, our mission has always been to deliver top-quality equipment with advanced technologies and features that raise the bar for everyone on the court. Our paddles are designed by players, for players. 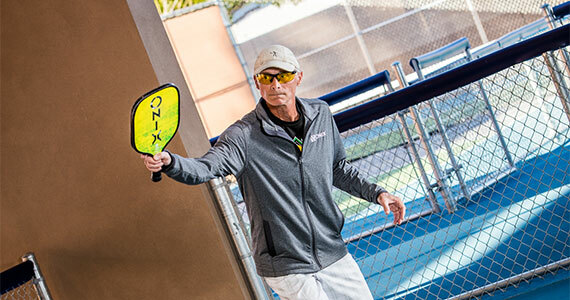 Through on-going research and development, our engineers are continually developing new products that lead the way for the entire pickleball community. 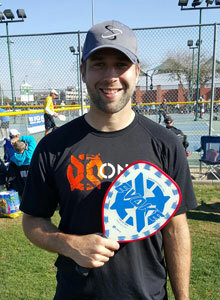 Our goal is to produce the best pickleball paddles, balls, and equipment that will take your game - and the entire sport of pickleball - to the next level. And we are doing just that. 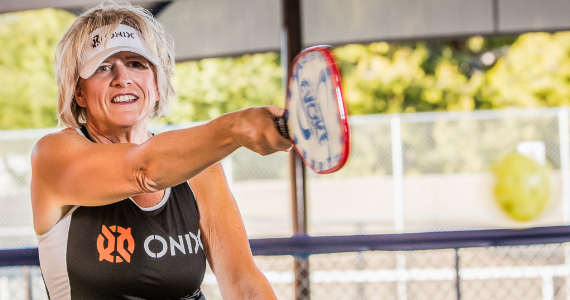 Take a look around, and you'll see why Onix is considered the best in pickleball. 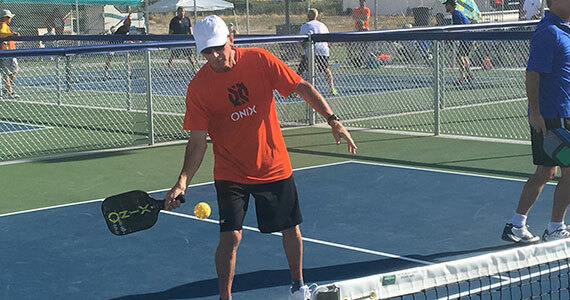 To ensure our products are at the forefront of professional pickleball play, we partner with elite players at the top-level of the sport that depend on Onix to give them an advantage on the court. 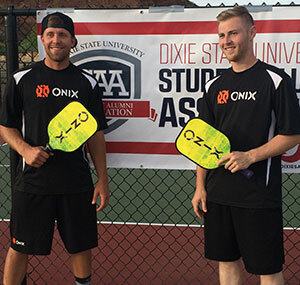 And just as our pro players trust Onix to provide top-quality products, we look to our players for expertise in developing innovative pickleball equipment with professional-level refinement. Our phenomenal players play in national tournaments across the country, representing Team Onix and the excellence that we strive for every day. What does pickleball mean to you? Pickleball is a fun sport that is great to play with family. My parents and 3 sisters play. It’s also lots of fun going to other communities and meeting new people. Everyone is so friendly and it makes for a nice time. 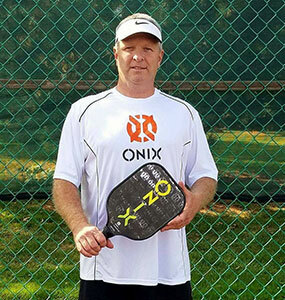 What Onix paddle do you like and why do you like it? I use the Onix React. I like it because it doesn’t have too much pop and it gives me lots of control at the net. It also has a nomex insert that allows me to hit with power when I need to. 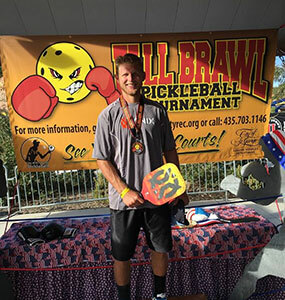 Can you give us two or three of your achievements in pickleball tournaments? At my first tournament a month into playing, my opponent hit a drop that went wide on the court. I was behind the baseline and was able to dive to get to the ball and hit it around the post to win the match. 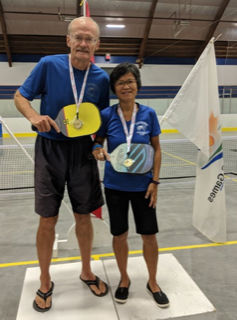 A year later, I played in the same tournament and brought home 4 gold medals; 2 in mixed doubles – aged and open, and 2 in men’s doubles – aged and open. What ONIX paddle do you use and why do you like it? I use the ONIX React paddle. I like the touch and control I have. In addition, I can generate a lot of power without over-swinging. What is your style / strategy? I tend to play a combination of soft and attacking style of play. I love to use very deceptive shot to keep my opponents off balance. What does pickleball mean to you? I was a highly competitive racquetball player. After undergoing major back surgery, my doctor said that if I ever dove on the racquetball court I might never get up off of the floor. Unable to play the sport I love, I was a bit despondent until I discovered Pickleball. It is less strenuous than racquetball and allowed me to be competitive again without fear of being severely injured. How long have you been playing pickleball? About one year. What ONIX paddle do you use and why do you like it? The Onix Graphite Z5 because it has great touch and just enough power to smash balls down on people. What is your favorite thing about pickleball? It is so addicting and I love the coordination and hand speed it takes to be good. Plus, quickness and agility, which are my strong suits, are needed as well. What is your favorite memory playing pickleball? Getting to play in the Tournament of Champions and having an amazing behind the back shot to win a match. What ONIX paddle do you use and why do you like it? I use the Evoke Teardrop paddle. The Evoke is a light paddle but still provides me with power for the hard shots and control for ball placement. It also has just the right touch for the soft "dink" game. What is your style / strategy? Without giving too much away, I alternate between a controlled soft game with a sprinkle of hard, fast powerful strokes. What is your style / strategy? I like to mix up playing soft and hitting hard. What does pickleball mean to you? My whole family plays PB, all six kids and my wife. Sometimes we have had all 6 of us entered in tournaments. That's a lot of "Sheffield's" announced for courts. It's one of the ways we stay close as a family. How were you introduced to pickleball? 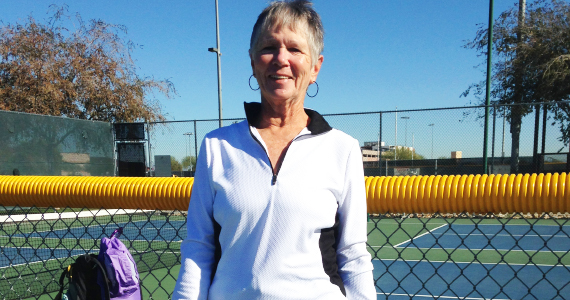 I friend that I play tennis with introduced our tennis group to Pickleball. I was immediately hooked and wanted to know where I could play! What is your style / strategy? Forget calm ... Crush it! What ONIX paddle do you use and why do you like it? Evoke Graphite - great feel with touch. The Evoke provides the accuracy and feel needed to play the "soft" game. What is your style / strategy? Get the game to a soft dinking match, be patient, force the other team to either hit the ball high, or lull them to boredom so they make a mistake. What does pickleball mean to you? Pickleball means new challenges. I'm a retired golf professional. I started playing golf at age 10. After 12 years in the Navy as a Nurse Corps Officer, I began my career as a golf professional. We moved to The Villages to play golf, and instead I got hooked on pickleball. 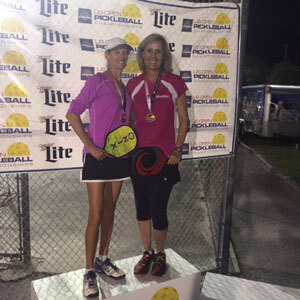 My golf level of play was the highest it could be, but pickleball gave me a new challenge. It is great exercise, it tests your mental capacity for performance under pressure and it is fun. It also challenged me to become a better partner. Golf is all about you and the course, if you make a mistake, it's on you. I perform better when I get a little upset with myself. That doesn't work in a game where there are partners. I've had to learn to be more supportive and less critical. So pickleball is making me a better person. What does pickleball mean to you? 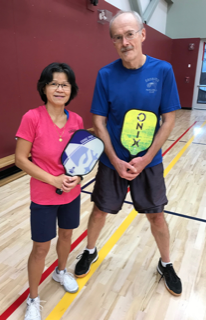 Pickleball is a means of exercise, a way to be competitive and enjoy enjoy seeing old and new friends at the same time. I find whether I go out to play socially, go out to practice or play in a tournament I can't get enough of either aspect. What could be better?! How were you introduced to pickleball? I was a softball tournament player and never played racket sports before I accidentally ran into pickleball. Two years later I was ONLY playing pickleball. What ONIX paddle do you use and why do you like it? My favorite paddle right now is the Onix React. It has great touch to it. I actually feel like my third shot has gotten a lot better with a lot more accuracy. What do you love about Pickleball? A lot of it is the people you play with. I love the people. I love the game. The combination of tennis and, I say, chess in some ways. There’s a lot of strategy. It’s a very mental game. How long have you been playing Pickleball? I’ve been playing pickleball for about 25 years. I played in PE in Seattle, where I grew up. My dad had a court in the back yard. What ONIX paddle do you use and why do you like it? I play with the green React paddle that is made of nomex material. I love the feel on my ground strokes and it has great touch when I am up at the net. What does pickleball mean to you? Pickleball is my life. When I am not at school or work, I am on the courts. It literally is my 2nd home. Being a part of team Onix has meant everything to me as well because it shows that hard work pays off. What is your style / strategy? My strategy is obviously at the net. I am very patient and love the dinking game. My tennis game has helped my pickleball a lot. What ONIX paddle do you use and why do you like it? I’m currently playing with the Evoke XL Graphite. It has good touch to it and I like the weight; a lighter paddle. What do you love about pickleball? I love everything about Pickleball. I grew up with a tennis background. But the people of pickleball are super nice. So I love the social and the athletic part of pickleball. 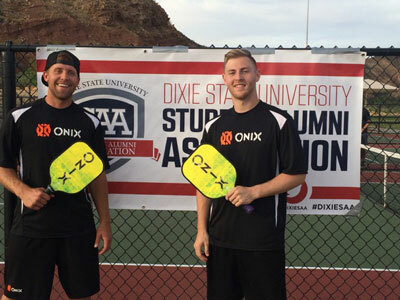 How long have you been playing Pickleball? I’ve been playing pickleball for about 2 1/2 years. What does pickleball mean to you? It’s a huge part of my life. In fact my life revolves around pickleball. What is your style / strategy? I’d say I have a better power game than soft game, but always striving towards a better all-around game. How were you introduced to pickleball? I responded to an article in The Albuquerque Journal talking about a sport that combined table tennis, tennis, and badminton skills. Started indoors and had fun, but once I took it outside in April, I was hooked. What ONIX paddle do you use and why do you like it? I love the Onix Z5 Graphite. For me, it has enough touch and pop, and it’s very, very durable. I’m an aggressive player, so I’m sliding on the court, and the paddle has held up with me. 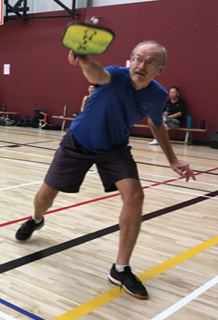 What do you love about pickleball? I love that when I play, I’m always the youngest one. But, starting recently, that’s starting to change. How long have you been playing Pickleball? I’ve been playing more seriously the last two years. What ONIX paddle do you use and why do you like it? I really like using the Z5 because it has a great soft touch at the net but a lot of power to put balls away. What does pickleball mean to you? 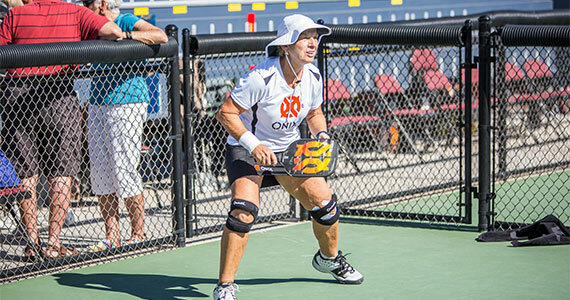 Pickleball means having fun and pushing yourself to be the best. What is your style / strategy? My style is slow and methodical until the time is right. What ONIX paddle do you use and why do you like it? I've been playing with the Evoke since it first came out. The Evoke is light enough to make reflex volleys, dinks, and shots requiring finesse. But, it still has the power I need to put away overheads and "shots of opportunity." What is your style / strategy? When I first started playing I would have to say that I was a "banger" who liked to hit the ball as hard as I could. I think my powerful overheads came from my years of practice smashing overheads in badminton. At the more advanced levels of play, however, your opponents don't give you as many opportunities to take advantage of weak lobs or returns. At the 5.0 level, the game is more about finesse, precise ball placement, and reflex volleys. So, my game has had to evolve into a more balanced game of finesse most of the time, but power if there is an opportunity. How were you introduced to pickleball? I played badminton in the Philippines competitively. After my husband and I moved to Phoenix in 2013, I searched for places to play competitive badminton. But the only indoor badminton courts I could find were quite far from where we live. I came to realize that people here in America mostly play badminton as a fun game and not the competitive sport it is in Southeast Asia. The residential area in which we live has a 300+ member pickleball club and eight pickleball courts. One evening my husband and I decided to check it out. We came back the next night, started playing, and immediately loved the game. How were you introduced to pickleball? My wife Terrie and I went to the local gym one Saturday morning. I decided I couldn’t get on one of those boring exercise machines so I went into the gym and watched some of the regulars playing pickleball. Within five minutes someone had me out on the court playing some points. How long have you been playing pickleball? I have only been playing the game less than two years. What ONIX paddle do you use and why do you like it? I play with the Onix React. I believe it has the best combination of feel for the touch shots and power for the overheads and hard drives. It consistently produces quality shots. What is your style / strategy? I play a very controlled game. I believe in extending the point and keeping the ball in play. As a result I like to move my partner and me up to the NVZ as quickly as possible to begin the dinking chess match and waiting for the opportunity to attack our opponents with fast paced shots. What is your favorite thing about pickleball? The people. I have been fortunate to have had two couples (Thanks Jan/Jack & Jo/Shirley) that I consider great mentors who helped me improve my game. Another up and coming player was instrumental in helping me gain my IPTPA certification by drilling anytime I asked. People are very friendly in this sport and always willing to invite others to play and learn the game. 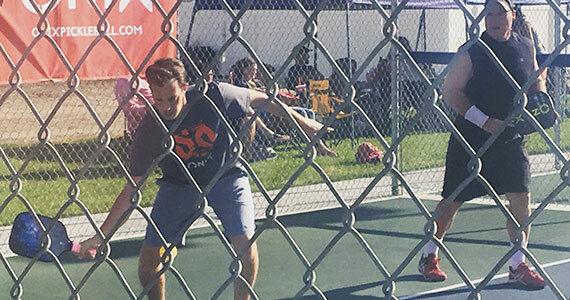 What is your favorite memory playing pickleball? I introduced the sport to a former racquetball player who had the athletic aspects of racquet sports. 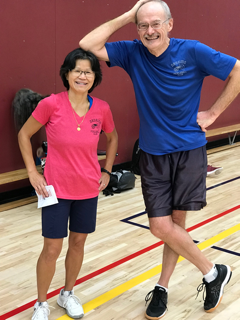 Working with him on specific pickleball skills and watching him not only execute the shots but also understand why the shots were important and when to use them as part of strategic shot selection was very rewarding. He has now become a very good local player. What ONIX paddle do you use and why do you like it? I primarily use the Evoke Composite Teardrop. It’s lighter weight keeps my hands fast and I love the touch and spin I can generate with it. What is your style / strategy? I like to play soft and with touch until it’s time to pounce. A hot sunny day in AZ when the ball feels like mush is my ideal conditions. What does pickleball mean to you? Pickleball is great for a variety of reasons. I love the strategy, the complex simplicity of the game and that you can play nonstop for hours. I also love the social aspect, with everyone having such busy lives nowadays it’s sometimes the only time my friends and I will get to see each other for a few weeks. I’ve met a ton of great people, got to travel to some places I probably never would have otherwise and it never seems to get boring. What ONIX paddle do you use and why do you like it? I am currently playing with the React. What does pickleball mean to you? It keeps me fit, gives me the competition that I love and allows me to meet so many great people. Since I am a retired physical education teacher and coach it also gives me a chance to teach and share my knowledge. What is your style / strategy? I am a control player. I love dinking until I finally have the advantage to pop the ball. What ONIX paddle do you use and why do you like it? I used to use the Onix Voyager, from there I have been jumping from paddle to paddle but I really like the Onix Inferno! How were you introduced to pickleball? I was introduced to pickleball by some parents of my friends in high school. I used to condition on the swim team for tennis, they needed a fourth one day and the rest is history. 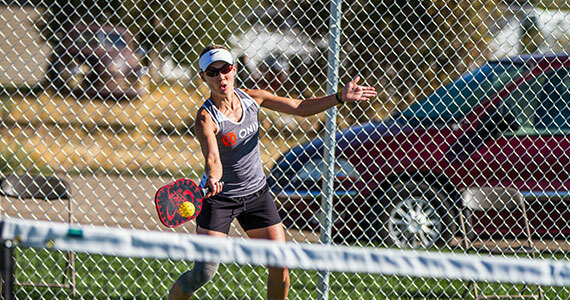 How long have you been playing pickleball? I have been playing pickleball for 7 years. What do you love about pickleball? Pickleball is RAD! It means a lot to me. I still coach and play tennis but I really enjoy the environment and competition in pickleball. What is your style / strategy? I have no idea ill have to check the videos on that one. I definitely play like my tennis game so it was hard to adjust at first to dinks and to not serve and volley. What ONIX paddle do you use and why do you like it? Onix React Polycore - I like the balance and responsiveness I get on both power shots and soft touch shots. What does pickleball mean to you? It truly has been life-changing. My wife and I have met so many wonderful new friends. We've traveled to places, and countries, where we never thought we'd go, all due to pickleball. The most important thing, though, is the wonderful friendships we have formed. Pickleball is a great community of wonderful people. What is your style / strategy? I’m an "opportunists." I don't overpower teams. I try to make high-percentage shots and look for opportunities to win the points. What ONIX paddle do you use and why do you like it? I prefer the ONIX React. The face has some stiffness to it, giving the ball some zip when I need it. But not so stiff that control and ability to place the ball are sacrificed. What is your style / strategy? Partner. When playing doubles, what can I do or say (or not do or say) that will bolster my partner's confidence in their game, and in our team play? Persistence. There is always a chance to earn a point or sideout if you are willing to take one more step to get to the ball even if it seems out of play. If you don't try at all, there is a zero percent chance. What does pickleball mean to you? I can't think of another sport that can be taught in about an hour and everyone can play an enjoyable game during the second hour. 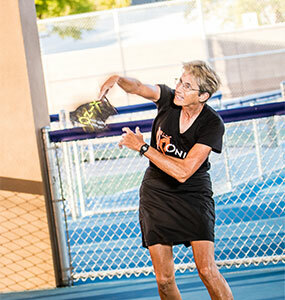 Pickleball isn't geared to a certain age or require superior athleticism or agility to have a good time. Laughing at the wacky play, and at yourself, is part of the game. It's simplistic on it's face, yet there are so many nuances of the game that a person can continue to challenge themselves for years. How were you introduced to pickleball? Steve Paranto introduced me to the game back in 1984. What paddle to you use and why? I currently use the Summit paddle. I used the Onix React before this one. What is your style /strategy? Our strategy is to dink until it's popped up, then hit down for a winner. What is your favorite memory in Pickleball? Winning Nationals the first time and the third time. What Onix paddle do you use and why do you like it? Onix React paddle. I like it for the power and control I get on my shots. What is your style/strategy? My style is more dynamic and quicker, a more creative game encompassing power and speed. How long have you been playing pickleball? A friend introduced me to the game 3.5 years ago and I was hooked on the first try. What Onix paddle do you use and why do you like it? Onix Evoke Pro. It's great for the soft game with enough power for the hard shots. What is your style/strategy? I like the soft dinking game. I like to place the ball as to set up my partner for the put away shot.